There’s a great thread over on solobasssteve.com about this, where Tom asks about the way that downloads are allowing classical music to be consumed in the way it was intended – in mixed programmes of individual movements, or of complete works without the weird filler stuff that’s used to make up the empty bit on the CD. In short, music can go back to being as broad and innovative in its programming as it was before recordings put a fence round the way we think about such things. Imagine being able to download Wagner’s entire Ring Cycle without considering the length of it in terms of the number of CDs – or sides of vinyl – that it occupies. Or conversely, to buy Edgar Varese’s Ionizations (sp?) and not get a load of other stuff bolted on the end because it was ‘too short’ to be an album. With downloads we can think with a much greater degree of abstraction about what the collections of music that we sell are. We can include other people’s music in with our own if we want to help out with promo, we can offer different compilation albums on themes without the need to press any physical copies. We can release multiple versions or multiple mixes optimised for different kinds of playback, again without the need to fragment our physical production process – just re-encode the MP3s and upload them to your site. It would also be perfectly possible to release an 8 hour continuous piece of music – no breaks, no track numbers, just one huge chunk of audio that takes 3 days to download, but you’d need to take a sickie from work to be able to experience in its entirety. And of course, digital files can be MUCH higher quality than CD ever afforded – the initial hype about CD masked us to the reality that it’s not a particularly high res format. It’s certainly good ‘enough’ but the option is there to release true audiophile mixes of things at 24 or 32 bit, at 96 or 192kbps. Way beyond the 16bit/44.1kbps resolution of CD. When you throw in the option to add a creative commons licence to a work and allow other people to do the mashing up, the potential for creative recontextualization of a bit of music is huge. Anyone got any other interesting applications of the freedom that digital music affords us? Cheers for this post. I think that it’s true. Scalability and flexibility of recordings now are major plus points. For example, I can think of at least a couple of long live tracks (Coltrane and Tangerine Dream) that span more than a side of vinyl with fade-outs and fade-ins at the join. CDs don’t always fix this issue. On the other hand, someone like Mika (bear with me) has just released some tracks in a near-EP format that artistically bridge larger recording projects. It probably isn’t enough for a full CD, but it cleverly keeps the artist in the public eye and anticipates the next piece of work. I also like the idea of releasing music that wouldn’t ordinarily be released. Not just because of the lack of a label (referring to your earlier post), but because of the interest in alternative versions, out-takes, demos etc that might only ever see the light of day in a retrospective CD. It involves the listener in the creative process, like seeing an artist’s sketch book. I don’t think that CD singles ever worked. The CD format is also about size compared with vinyl or even tape. LPs used to be 25-30 minutes a side (you could copy two albums on to a C90). I think CDs still reference this in terms of volume. A big question though is the old one about packaging. Digital formats have stripped this away. So what do you do about providing presentation and a context for the music? Lyrics, branding, background or technical information? I suppose a web site can provide this readily enough, but as it becomes physically separated from the music, is the music diminished? Bear in mind that at a gig the music is presented. Radio stations and podcasts also provide a context that the music alone doesn’t provide. Overall, I find the possibilities pretty exciting. I agree very much with the above posts! Also, no one seems to have mentioned the cost benefits of digital formats- the abolition of scarcity. Perhaps that seems too obvious! But in reference to your quality comments, it costs just as little to bounce something as a 98kbp/s, 24 bit file as a low quality file! And for clear reasons, CDs cost more. The only ‘issue’ with that is virtual space… And by the end of this year 50% of us will be carrying around portable one to two terabyte hard drives. Problem solved! Brilliant post, don’t know how you manage to write so much in quick succession! cool and brilliant, steve… and definitively not to forget the pleasure of enjoying full blast live performances of any style, music, dance, theater, on audio and video formats. What I come to think of is the extension of the track itself. The metadata, independent of the environment. “First time you listen to Steve Lawson?”, “well click here and this is his best picks”. 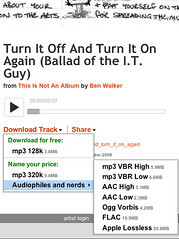 A dynamic approach with metadata, as you suggested above. Downloadable or streamable of your choice. An endless journey…. I have had this idea banging around my head for a couple of years and that is to also release the tracks as 4-channel or 8-channel tracks for the music fan in addition to the 2-track mix. Also include music notation and a tutorial on how to play the songs on the cd or whatever format. Show how to play the song, you could then play along with the “band” as it were. For example, if you were (gasp) a bassist, you could turn the bass track off and play along. Do the same with other instruments. I’ve just posted a response to this on my blog, by way of an example of somebody getting the post-Album format right: The Beatles Complete On Ukulele: what was so good about The Album anyway? I don’t think for a second that the producers behind the project (Roger and Dave) have found the perfect format, but they have shown that if you think about the listener’s experience when creating your delivery channels you can make something peculiar to your project that does everything The Album used to do. @Charlie: I love the idea of being able to turn the bass off and play along, and I wouldn’t be surprised if we see a resurgence of “official” sheet music and tab too (to be downloaded with the music or on the artist’s website). I’ve definitely been playing with the idea.